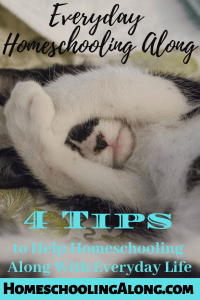 How to Homeschool Along with your everyday life. We have been homeschooling for 4 years now, along with Cooking, cleaning, laundry, food shopping, yard work, swimming lessons, piano lessons, golf lessons, camping and simply living. Needless to say, it was a no-brainer when the time came to pick this website’s name, my husband asked: “What would you like to name your website”? And without even blinking the words “Homeschooling Along” came out! Yes, homeschooling our children is a full-time job itself and while we do it, the rest of our world doesn’t stop and it can be challenging sometimes trying to keep up. While we are teaching our little ones reading, spelling, writing, geography, science, history, etc.. the laundry is piling up, the house is getting dirtier and dirtier, the time that our husbands return from work after an 8-10 hours shift is getting closer and closer and no dinner is ready… This might be a surprise to those who think that we homeschooling moms just sit home sipping our coffee watching TV while our children do their work, but we homeschoolers know it couldn’t be further more from the truth. So how to avoid the pitfall of piling laundry, scrambling to get a meal ready, dust bunnies collecting behind room doors, and so on? Well, my first reaction when my husband realizes I’m not having a stellar week and asks me “What can I do to help”? is “I need a cook, a house-cleaner and a landscaper”!🆘🙋‍♀️ Now, although we did finally manage to hire a landscaper after 4 yrs, realistically most homeschooling families like us, are living on one income, so being able to hire all these hands to help is just not possible. Delegate, delegate, delegate. Have I mentioned to delegate? 😂 If you try to do everything yourself you will be driving yourself crazy and burn out real fast. Delegate as much as you can even to your little ones! Sometimes them just transferring the laundry from the washing machine into the dryer is a big help. When we delegate even smaller task those minutes all add up and you’ll be surprised what a difference it can make. Delegate bed making, garbage emptying, dish-washing or dishwasher loading/unloading, vacuuming. Any kid 6 or up can take care of those tasks. Any light school work that needs to get done, for example, the reading of a History, Health or science reader to the kids, can be left for your husband or whoever is part of your family that is able to sit down and read to the children. Prioritize. Sometimes (whom I kidding, all the time), getting everything done is just not possible. I find my self having to pick between doing laundry or washing dishes, putting away the laundry sitting on my couch for the last 2 days or going to take a shower, and so on. This might sound crazy to some but it’s the cold hard reality of homeschooling, raising kids while running a household. Prioritizing what needs to get done has helped me not lose my mind, but the feeling that I should be able to do more and manage my time better did not leave me and maybe that’s just Gods way of keeping me on my toes and always trying to better my ways. I’m learning along with my children, I’m learning thru my children’s eyes, I’m able to shape them and feed them info that I feel is appropriate for their age, and last but not least I am trying to raise children that will be a great asset to our society with God’s help and guidance (I will talk more about Homeschooling and religion on another post), and these are all Blessings that make all my other downfalls look very small and unimportant. Take regular breaks. Academics are important but our relationship with our children is more important. If at times you need a day to recollect and get things in order then just take a day off and go do what makes you happy. You’ll see that your mindset will be different and your outlook on the next day will too. I also found that once every couple of months I need a mental break and I’m pretty sure our kids do too. 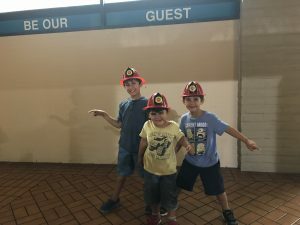 We usually try to plan a short camping trip on a long weekend and do something together as a family away from our everyday chores or regular activities. This gives us all a chance to decompress and come back recharged with brand new energy, and good energy too! 💆‍♀️ If camping trips are not an option for you, even taking just a long weekend off from school and maybe a visit to your local zoo or museum would be a good idea for a break. It gives everyone something to look forward to and our kids will much rather have a happy relaxed mom than a stressed, cranky, tired mom teaching their lesson. “A person plans his way, but the LORD directs his steps”. Delegate, delegate, delegate! Absolutely! It really helps when kids are old enough to pitch in and help around the house.